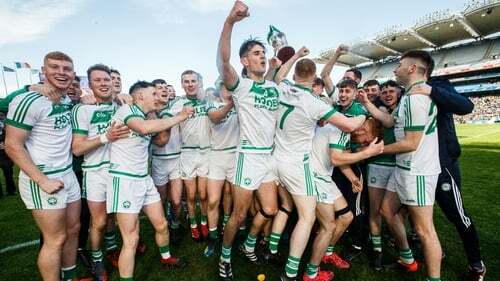 Colin Fennelly hit 2-04 as Henry Shefflin’s Ballyhale Shamrocks stormed clear in the second half to claim their seventh All-Ireland club SHC title at Croke Park. The Kilkenny champions led 2-10 to 1-08 after an entertaining first period that saw Fennelly raise two green flags, the second from an audacious piece of skill, but St Thomas’ hit back with a penalty from Galway star Conor Cooney. It was all one-way traffic after the break, however, as Thomas only managed four scores – including a late consolation goal from Darragh Burke - and Ballyhale sent over a relentless stream of points to seal a comfortable victory on a St Patrick's Day that was all about Shamrocks. In his first season as a manager, Shefflin has led the village club to a crown he won three times as a player, taking Ballyhale three clear of Birr and Portumna at the top of the pile. The Kilkenny club had threatened to streak clear from the start. A nervous-looking St Thomas’ hit a poor wide and overplayed a handpass when well placed while Shamrocks were far more clinical, moving three clear thanks to a point from Adrian Mullen either side of a free and first from play for TJ Reid. Darragh Burke opened the scoring for the Galway men from a free but Mullen added another and in the fifth minute Colin Fennelly pounced for the first time. The towering full-forward got in behind the defence and though his shot was saved by Gerald Murray, the keeper could only parry it straight back out and Fennelly batted to the net. Six points down and the game barely begun, Thomas’ could have been forgiven for losing heart but they hit back with points from Darragh Burke and Bernard Burke before the lifeline of a penalty arrived. Corner-back Darren Mullen charged through the back of Damien McGlynn – a late starter for the injured Éanna Burke – and was booked for his troubles. Conor Cooney, otherwise out of sorts throughout, stepped up to lash the ball low to the left corner of the net beyond Dean Mason. Ballyhale pulled three clear again through Mullen and TJ but Thomas rallied once more, a McGlynn effort – confirmed by Hawk-Eye, superb long-rang score from James Regan and free from Darragh Burke levelling it up by the 20th minute – 1-6 apiece. Colin Fennelly had other ideas. First, he was denied a goal by inches as a dropping ball deceived Murray and he flicked a half-volley just over the bar. Then, a moment of breath-taking skill. Mullen’s shot looked to be heading well to the left and wide but Fennelly dived and, at full stretch under pressure from Seán Skehill, managed to flick the ball back over his shoulder, across Murray and into the right side of the net. Reid then started to make his presence felt, scoring after a fine catch, adding a free and setting up Evan Shefflin. Thomas’ hit back with frees from Burke and the lead was five at the break – 2-10 to 1-08. The stage seemed set for a gripping second half but it turned into another club final coronation - this time for King Henry. Darragh Burke struck the first point to raise a massive cheer from the Thomas’ crowd but that was their last score for a quarter of an hour as TJ Reid (0-4 from play), Patrick Mullen, Adrian Mullen (0-5) and Fennelly all fired over, seemingly, at will. The sight of Cooney going for goal from a 20m free with 15 minutes to play – it was blocked – was indicative of Thomas’ already being resigned to their fate. Darragh Burke got Thomas' second goal, swiping a Shane Cooney delivery past Mason, six minutes into injury-time but even that only reduced the lead to 16 points. Eight added minutes due to treatment for a Fintan Burke injury meant the footballers of Corofin and Dr Crokes were already on the field by the time Michael Fennelly was making his acceptance speech – the former Hurler of the Year had his mic cut off mid-flow. He won’t be too concerned with that as Shamrocks had already done their talking on the pitch. Ballyhale: Dean Mason; Darren Mullen, Joey Holden, Brian Butler; Evan Shefflin (0-1), Michael Fennelly (capt), Patrick Mullen (0-2); Ronan Corcoran (0-1), Richie Reid (0-1); Brian Cody (0-2), TJ Reid (0-9, 5f), Adrian Mullen (0-5); Eoin Reid, Colin Fennelly (2-4), Eoin Cody (0-2). Subs: Mark Aylward (0-1) for E Reid (42), Joseph Cuddihy for E Cody (54), Kevin Mullen for D Mullen (58), Conor Walsh fort R Reid (58) Gavin Butler for M Fennelly (60). St Thomas’: Gerald Murray; Cian Mahoney, Cathal Burke, Seán Skehill; Donal Cooney, Shane Cooney, Fintan Burke (0-1); James Regan (0-1), David Burke; David Sherry, Darragh Burke (1-7, 5f, 1 65) Bernard Burke; Brendan Farrell (0-1), Conor Cooney (capt) (1-0), Damien McGlynn (0-1). Subs: Mark Caulfield for F Burke (42), Colin Fallon for S Regan (53), Cian Kelly for D Sherry (56), Damien Finnerty for D McGlynn (60).